Thank you Naples Daily News for this great story in the November 22, 2014 issue! IMMOKALEE, Fla. – They worked after classes, and between jobs and homework. They played with their grandmas’ recipes at their homes and in commercial kitchens in the area. 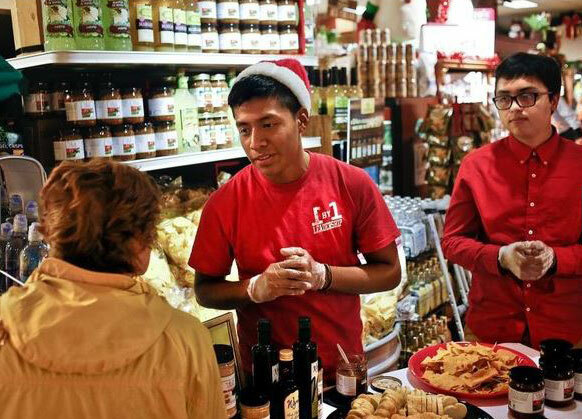 The idea was to experiment with the flavors of Immokalee and develop food products that taste like their hometown. 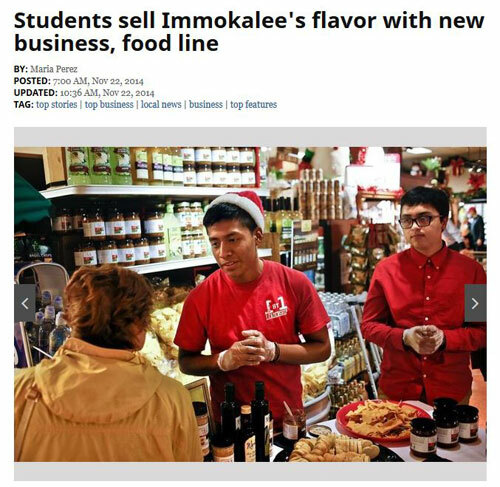 Over the last year, a group of Immokalee high school students, with the help of professional mentors, started their own food line and business, Taste of Immokalee. So far they have developed four products; a spice mix, a fire roasted tomato and jalapeno sauce, an Immokalee hamburger and orange zest chocolate chip cookies. Last week they received their first order from a retailer, Wynn’s Market in Naples, which is selling their spice mix and sauce for $6.99 each. This, they say, is just the start. The students, many raised in farmworker families, want to reach other stores, develop new products and sell enough to build a bottling plant in town. The factory would bring jobs to their community. The profits they’ve already earned, almost $2,000, would pay for Immokalee students scholarships. The idea for the project came after a day of packing meals for the nonprofit Meals of Hope, said Elizabeth Martinez, 18. While riding a bus with students and staff of the One by One Leadership Foundation program, which mentors Immokalee students, Martinez said she and her sister talked about how neat it would be if they could develop their own food products in Immokalee. Within weeks, staff at One by One obtained a grant from State Farm Insurance that allowed them to start in August 2013. The initial group of 16 students divided up into four teams and brainstormed ideas, some of which, like the tomato smoothie, weren’t marketable, said Stephen Popper, the executive director of Meals of Hope who also serves as a mentor with the One by One program. It was a learning process for the students, he said. Each group experimented with local spices and foods, developed products and together narrowed them down to one per team. They concluded that Immokalee tastes like roasted tomatoes, jalapenos, peppers, chili powder and oranges, ingredients many Immokalee families have at their table and had in their countries of origin. They combined those flavors in recipes their families brought with them with their own additions. The origin of their Sabrosito Sensacional spice mix – made of oregano, chili, garlic powder, salt and pepper – was a recipe by Martinez’s Mexican-born grandma. She asked her what she puts in the meals she prepares, and Martinez incorporated chili. She said it made it even better. Instead of a mix, at the beginning the students thought of selling a bottle with compartments for different spices. Eventually they agreed a blending would be better and more unique. “The mixture allows individuals to have a feeling of what Immokalee is, of its diversity,” Martinez said. While doing their research, the students found many supermarkets don’t offer roasted tomato sauces, a frequent ingredient of meals prepared in Immokalee homes, Estrada said. So they produced one with red vine tomatoes, jalapenos, onions, pepper and cilantro. In addition to developing the products, the students, with their mentors’ help, analyzed their market, figured out their cost and profit margins, kept accounting books, designed labels and promoted their products, which don’t have preservatives or allergens. They’ve contracted with Sarasota-based Best Brand Bottlers, Inc. to bottle their food. Like their products, their logo has an Immokalee flavor. Every element has a purpose, like the green lines below the red letters. “This symbolizes Immokalee, the tomato fields and the groves,” Villalobos-Perez said, pointing at the label. They must learn how to distribute their Sunny Home cookies, made with chocolate chips and zest from oranges, like those cultivated in Immokalee. A few hours after baking, the cookies harden, so they don’t think they can sell them in stores, Villalobos-Perez said. They are considering pitching them to cafes or selling them at events where they could be eaten fresh. They also don’t know how to market their Immokalee burger, a hamburger made with Immokalee spices. Early on, the burger was the product that everyone thought would be the biggest success. But because they’re dealing with raw meat, they’ve found it may be the hardest to sell. The students said they’re getting a great response from people who try their products. Some clients are emailing them to purchase more. The number of students involved with the project fluctuates, but they say they’re pushing hard for their food.